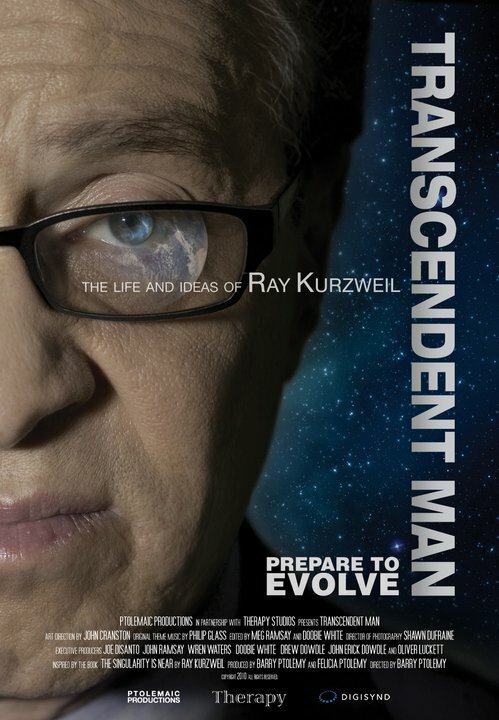 Transcendent Man, the film about the life and ideas of Ray Kurzweil by director Barry Ptolemy, is available today (May 24, 2011) on DVD in stores nationwide (Best Buy and Barnes and Noble), according to Ptolemaic Productions. The DVD will also be available for order on Amazon.com, WalMart.com, BestBuy.com, and BarnesandNoble.com, and on Netflix (DVD and “Watch Instantly”). Suggested retail price is $29.95. The DVD includes more than two hours of exclusive additional footage, with deleted scenes, extra interviews, and the Q&A with Ray Kurzweil and director Barry Ptolemy after the world premiere at the Tribeca Film Festival. Transcendent Man is also available for downloading on iTunes and Movies On Demand (both without the extra two hours). In Transcendent Man, Ptolemy follows Kurzweil around the globe as he presents the daring arguments from his bestselling book, The Singularity is Near: When Humans Transcend Biology. Kurzweil predicts that with the ever-accelerating rate of technological change, humanity is fast approaching an era in which our intelligence will become increasingly non-biological and millions of times more powerful. This will be the dawning of a new civilization, enabling us to transcend our biological limitations, says Kurzweil. Since its premiere at the Tribeca Film Festival, Transcendent Man has drawn critical acclaim. During its worldwide festival tour, the film screened to sold-out audiences at Tribeca in New York, the American Film Institute Festival (AFI Fest) in Los Angeles, and the International Documentary Film Festival (IDFA) in Amsterdam. It was also screened in theaters in New York, Los Angeles, San Jose, San Francisco, New York, London, Boston, and Washington, D.C. The film was lauded as “one of the top ten documentaries of the year” by the International Documentary Association (IDA).